Loyalhanna Dockyard has sent in an example of one of Sirmar's latest efforts, a set of 1/48 scale gun sights. These are cleanly etched sites for various US (40mm and others) and British (Pom Pom, and ?) Anti aircraft weapons, as well as directors, such as the US Mk 51. . There are some sights on this sheet that I have not been able to identify, so perhaps you weapons experts out there can give me a hand with them. They are very accurate to the sights that I do have references for, and scale out well. They would make an excellent addition to a US or British 1/48 scale warship, and may be useful for other nation's ships who used similar equipment, as many gunsights do not vary greatly. Very useful, and recommended. Loyalhanna Dockyard has sent in two pairs of propellers for review. These are made in the UK by Prop Shop, and are a solid casting that has been polished. Available in a wide selection of diameters and blade counts, you should be able to find the right propeller for most projects, warship and civilian. My samples were nicely cast, and pre-bored and threaded for mounting on the end of the propeller shaft. The warship set was threaded 5-40, and I could not check it, but the merchant set was bored 10-32 and I chucked up a length of threaded rod in my lathe to check how true they run. Both exhibited a small, but acceptable amount of wobble; around .020 which is pretty good. A bit of thread locking compound would take up some of that as well. Casting was well done with no surface pitting, and the polishing was good, although they could stand a bit more time against the wheel. The prices of these propellers are pretty reasonable (no specific amounts were quoted, but I have seen list prices in the UK for these props) and they represent very good value for your money. I recommend this product to anyone who needs a nice scale prop for their project. These are very nice. 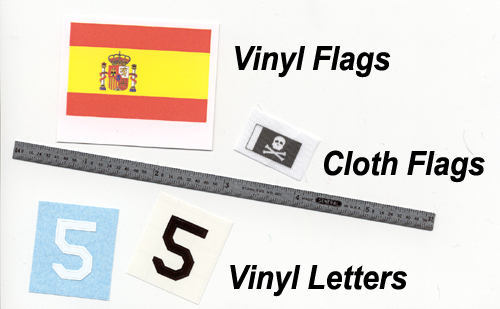 The Flags cover national and other maritime ensigns for most major countries. They are printed on both sides, and include a margin to mount them on a thread, and are available in a variety of sizes for just about every model. One cool thing that BECC makes are flags for model boat clubs; if you are lucky enough to be in one of these clubs you can have one of these little critters flying from your masthead! BECC also makes signal flags, which would be very nice on almost any model. Remember, that ships coming into port often have their radio call signs hoisted; this would make a great detail! Highly recommended. Nice, but of limited utility. Single sided, you can put them on your transmitter or tool box. If you are into racing power boats, they might be of use there too. An interesting product. The Vinyl is very thin, much thinner than the vinyl lettering you may have seen at office and graphic stores. The design that was sent to me is appropriate for most NATO pennant numbers, and were cut in a way to make outline numbers fairly easy to achieve. Note that NATO letters and numbers are in a different lettering style than US, so you may want to check your references before using them on a US warship. They also make Plimsol and other draft marking useful to the merchant ship modeler. Recommended. In the US, BECC products are carried by Loyalhanna Dockyard. In the UK, you can visit BECC direct by clicking here. Battleshipmodels.com sent in some bundles of wood strip for review. These are sold in 1 square foot bundles, and are available in many different species. Shown above are two types of teak, mahogany, walnut, koto and etimoe. Many other additional varieties are available on the website. The strips average about .020 in thickness, and I only measured a couple of thousands variance in thickness amongst woods of the same species. In width, they are slightly less than 1/4" wide, and the dimensions are held closely. Strips ranged from about 18 inches to almost 30 inches long. At the ends of many strips you see tapering or other defects, but it appears that the bundles are actually more than 1 square foot, so that you get at least this amount of usable, closely dimensioned wood. All the wood in my samples was of excellent quality, without knots or burn marks from cutting. The thinness of the strips makes cutting with a good pair of scissors possible, or a sharp X-Acto knife would work well of course. These strips would be of the highest utility for very large models, of 1:48 scale or bigger. If, for example, you are doing a civilian yacht with an inlaid deck, this product would be a great time and money saver. Or, if you want to create the deck on a 1/48 scale warship with wood decks, many of the varieties would be appropriate. On a smaller scale model, you will want to choose a species of finer grain than those in my samples, such as basswood. Additionally, strips would need to be narrower to be useful for 1/96 scale capital ship decks. They do, however present many interesting possibilities in displaying a smaller model, from planking a display base to creating a name plate background. Prices are very reasonable, just a bit more than purchasing veneer and cutting it yourself, and the small minimum quantity allows you to obtain a wide variety of woods without the expense of buying a lot of lumber. I know I will keep these strips in mind when I need just a small piece for a model, such as the varnished wood rails on the bridge wings of my DDG model; a little bit of that mahogany with a gloss finish will look pretty sharp there. Recommended. 6 visits to this page.